LCDR Lloyd Stanford “Stan” Smith relieved Captain Gallemore on 19 June 1958. Captain Smith eventually relieved Captain Gallemore again in command of the NROTC unit at Rensselaer Polytech, and it turns out they were earlier in the same company at the US Naval Academy. After several fleet exercises, the Irex, from 13 September to 20 December, 1958 toured the Mediterranean to operate with the 6th Fleet and NATO. The ports of call were Gibraltar, Naples, Palermo, Genoa, and Palma. Again, about 100 orphans were entertained. On 25 November the Irex moored on the port side of the North South Mole, Puerto Pi, Bay of Palma, Majorica, with the Redfin (SS-272) on the starboard side. Then on 6 December the Irex departed for Marseilles. During this trip, it seems the crew had a notoriously good time, which led to unfortunate medical repercussions for a third of all hands on board. In October 1958, XO Dickey was relieved by Herbert S. Klein. Mr. Dickey died in July 2005, while Mr. Klein died in March 2006. In March 1959, the boat went on a two-week cruise to Bermuda. At some point in 1959, Andrew Feindt became COB. LCDR Henry L. Braley relieved Captain Smith on 20 July 1959 and remained in command until 22 July 1960. Later that year, I believe, the Irex visited Philadelphia Navy Yard to replace a battery. In September 1959, there was another trip to Halifax, Nova Scotia. In January 1960, the Irex took part in the ASW (by aircraft?) fleet exercise LANTBEX 1-60 in the North Atlantic. After six weeks at sea, in late February (? ), the boat was struck by a powerful storm. Burt “Bob” Lancaster passes along this photo of the sorry details. And here is a report of the damage from another submarine there at the time. Frank Dorchak reports that the storm tore off much of the sail and with it all the antennas. Despite the damage, the snorkel antenna was fixed so that the boat might report back that she was OK. 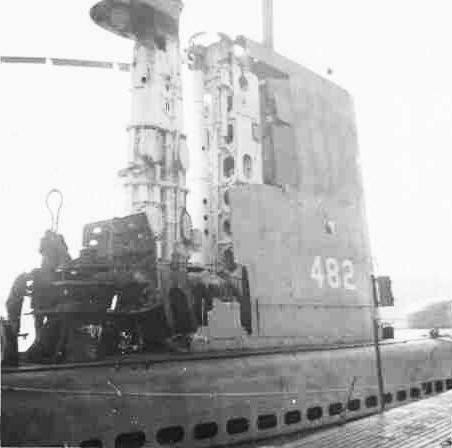 The Cavalla SS-244 avoided damage by diving to get under the storm. After the storm, the Cavalla accompanied the Irex to Belfast, where the Irex remained three days for some quick repairs. She then headed back on the surface to New London. Dorchak and Bob Lancaster tied a square knot in the after-wire antenna for excellent communications all the way home. The Irex reached New London on 3 March 1960. There followed operations out of New London and a training cruise to Halifax. In June 1960 the Irex returned again to Philadelphia for an overhaul, arriving back in New London just before Christmas. Captain Braley was relieved of command on 22 July 1960.